HONOLULU (AP) – Putting 75 years of resentment behind them, the leaders of the United States and Japan are coming together at Pearl Harbor for a historic pilgrimage to the site where the bloodshed of the surprise attacks drew America into World War II. Prime Minister Shinzo Abe’s visit Tuesday with President Barack Obama is powerful proof that the former enemies have transcended the recriminatory impulses that weighed down relations after the war, Japan’s government has said. Although Japanese leaders have visited Pearl Harbor before, Abe will be the first to visit the memorial that now rests on the hallowed waters above the sunken USS Arizona. For Obama, it’s likely the last time he will meet with a foreign leader as president, White House aides said. It’s a bookend of sorts for the president, who nearly eight years ago invited Abe’s predecessor to be the first leader that Obama hosted at the White House. For Abe, it’s an act of symbolic reciprocity, coming six months after Obama became the first sitting U.S. president to visit Hiroshima in Japan, where the U.S. dropped an atomic bomb in hopes of ending the war. More than 2,300 Americans died on Dec. 7, 1941, when more than 300 Japanese fighter planes and bombers attacked. More than 1,000 others were wounded. In the ensuing years, the U.S. incarcerated roughly 120,000 Japanese-Americans in internment camps before dropping atomic bombs in 1945 that killed some 140,000 people in Hiroshima and 70,000 in Nagasaki. Abe will not apologize for Pearl Harbor, his government has said. Nor did Obama apologize at Hiroshima in May, a visit that he and Abe used to emphasize their elusive aspirations for a nuclear-free future. After a formal meeting in the morning, Obama and Abe planned to lay a wreath aboard the USS Arizona Memorial, which is accessible only by boat. Then they’ll go to nearby Joint Base Pearl Harbor-Hickam, where both leaders will speak. Obama and Abe signed off on the visit last month when they met in Peru on the sidelines of an economic summit. Though the parallels with Obama’s Hiroshima visit are palpable, both governments said that one visit wasn’t contingent on the other. Since the war, the U.S. and Japan have built a powerful alliance that both sides say has grown stronger during Obama’s tenure. There are questions about what the relationship will look like under President-elect Donald Trump. During the campaign, Trump suggested that Japan and South Korea should obtain nuclear weapons so the U.S. would no longer be burdened with costs of defending them, a disquieting notion in many Asian capitals. But after Trump’s election, Abe became the first foreign leader to meet with him, sitting down in Trump Tower with the business mogul and Trump’s daughter, Ivanka. Though no Japanese prime minister has visited the USS Arizona Memorial, former Japanese leader leader Shigeru Yoshida visited Pearl Harbor in 1951, six years after Japan surrendered. He stopped there on his way home from signing the San Francisco peace treaty with the U.S. and others, and paid a courtesy visit to the office of Adm. Arthur W.R. Radford. 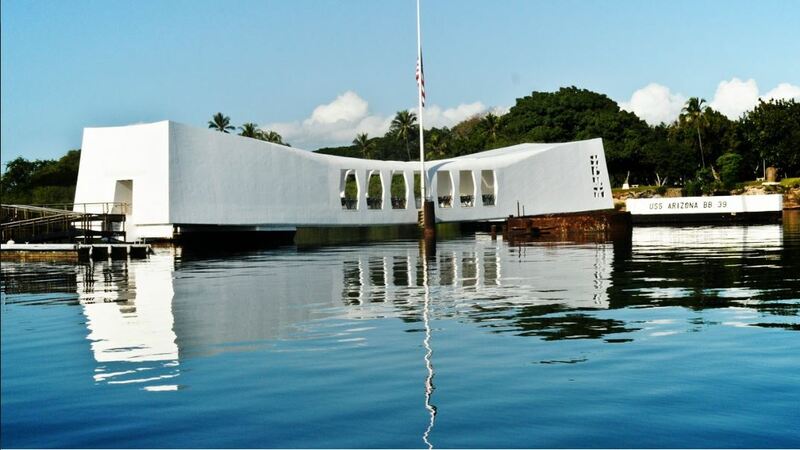 Other prime ministers have since visited Pearl Harbor and the National Memorial Cemetery of the Pacific, known as Punchbowl.